Chesapeake Bay is the world’s third-largest estuary. Its 64,000-square-mile watershed extends over of six states and the District of Columbia, and it is home to 18 million people. 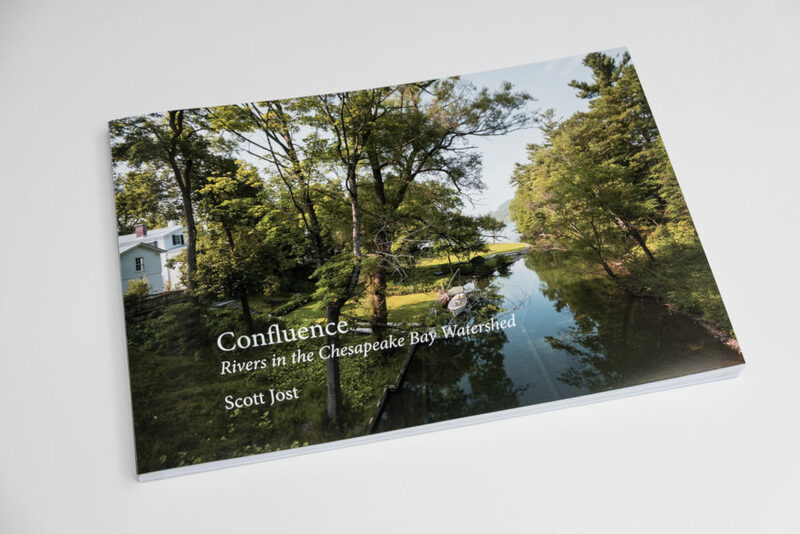 My forthcoming book, Confluence: Rivers in the Chesapeake Bay Watershed, creates a comprehensive portrait of the entire watershed through color panoramic photographs of the river and stream confluences within it. Confluences are historically important sites in relation to settlement, industry, commerce, transportation, and defense, exemplifying important intersections of nature and culture. Photographs in the book have been selected from those made at more than 200 sites throughout the watershed. As a fundraising tool I created a simple hand-bound book of sample images from Confluence, formatted at the book's anticipated 14 x 9.5 inch trim size. I published the sample pages in this book to ISSUU. You can view them by clicking the link below. While the book hasn't been designed yet (the cover shown here is just for the sample images), the sample pages provide a good idea of the size and placement of panoramic images in the finished book. View Confluence:Rivers in the Chesapeake Bay Watershed here. Photographs in the book will be arranged in three regional groupings, each progressing from headwaters to bay. The first group includes rivers and streams generally north and northwest of Chesapeake Bay in New York and Pennsylvania; the second group includes rivers and streams to the west of Chesapeake Bay in Maryland, West Virginia, Virginia and Washington, DC; and the third group includes rivers and streams on Delmarva Peninsula in Maryland, Delaware and Virginia. The book’s front and back matter will include a foreword written by a high-profile author with national visibility in ecology and history and specific expertise in the Chesapeake Bay watershed, an introductory essay that I will write, watershed map with photography locations, interpretive captions for selected photographs, a glossary of rivers and streams within the watershed, an “about the photographs” article, a comprehensive list of Chesapeake Bay watershed organizations and resources and additional photographs. The goal is to create a 160-page book featuring 70 full-color panoramic photographs in a landscape trim size of 9.5 x 14-inches and a print run of 1,000-1,250 copies. The list price will likely be $45.00.